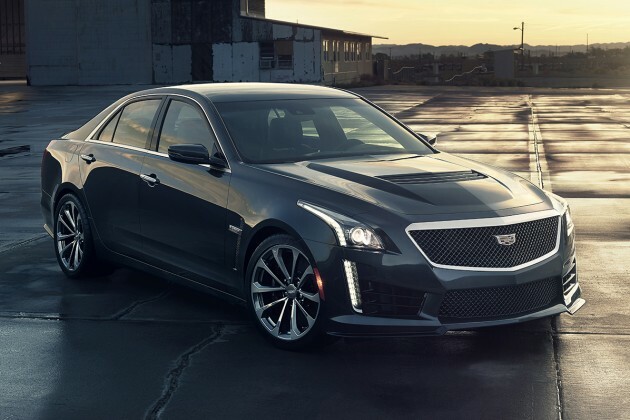 Looks like the BMW M5 will not only come under fire from the Lexus GS F teased last month – America will also fire its salvo at the German super sedan with the new 2016 Cadillac CTS-V, making its debut at the upcoming Detroit Auto Show. The third generation of the pumped-up executive sedan comes hot on the heels of the smaller ATS-V, unveiled at the LA Auto Show. Packing the firepower is the Corvette Z06‘s 6.2 LT4 supercharged and direct-injected V8, delivering a stout 640 hp and 855 Nm, making the CTS-V the most powerful Cadillac ever built. Unlike the previous model, the new car will be available solely with an automatic transmission – an eight-speed unit with paddle shifters, launch control and Performance Algorithm Shifting. Acceleration from 0-100 km/h is done in 3.7 seconds. Added bracing and strengthening has increased torsional rigidity by 25% over the regular CTS, while the chassis has been improved with a wider front and rear track, revised MacPherson strut front and multi-link rear suspension, stiffer variable-ratio electric power steering, larger prop shafts and a standard electronic limited slip differential. Also fitted are third-generation Magnetic Ride Control dampers, Performance Traction Management, a Corvette-derived Performance Data Recorder, Brembo brakes – six-piston callipers at the front, four pistons at the rear – and 19-inch forged aluminium wheels shod with bespoke Michelin Pilot Super Sport tyres. Marking the CTS-V out from regular models are aggressive front and rear bumpers, a vented carbon fibre bonnet, wider fenders and a rear lip spoiler. Buyers wanting an even sportier look can opt for a Carbon Fibre package with a carbon front splitter, hood vent, rear diffuser and spoiler. Inside, there are sportier 20-way power-adjustable front seats complete with heating and ventilation, while Recaro performance seats trimmed in Mulan leather with suede inserts are available as an option. A suede-covered steering wheel and gearknob can also be specified. 650bhp is quite a lot. But 850NM of torque is really amazing for a sedan. And this from a big block V8. So it should sound amazing as well – as was the previous CTS-V. With the normal CTS already a very good handling car, this should be even better. M5 owners should be worried, or just trade in their Beemer with the beast from Detroit. Now if they make a wagon version as they did with the previous CTS-V, it would be even better. On the other hand, the Cadilac is quite cheap and it’s said that it’s handling is not that bad. 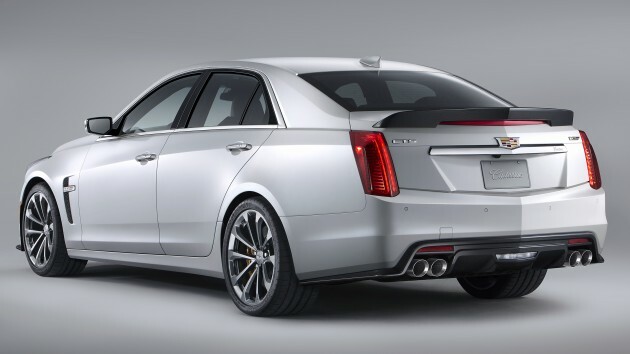 Actually the official statement from Cadillac is that it will “avoid the U.S.A. gas guzzler tax”, something the the BMW M5 or Merc E63 can not do. So it actually gets much better fuel economy than those other sedans. Waiting for the BMW Z5 guy to comment…. I also waiting.. what quad turbo la…. what 0-100km 2 sec la…. BN cybertroopers will say this car is not halal. Ada elemen Yahudi.